I don’t smoke. I don’t care if other people smoke either, just so long as it doesn’t infringe on me. I mean, you want to die that’s on you. I choose life. Anyway, there are there two women at my current job that smoke and take multiple (and I mean multiple) smoke breaks a day. 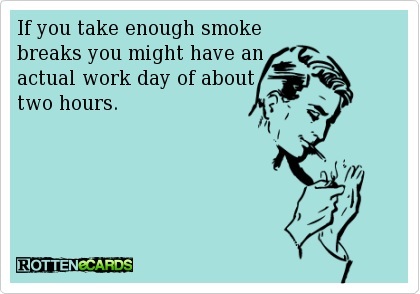 To the point they are probably not at their desks for a good hour a day just for these smoke breaks. It’s generally annoying, not going to lose my sh*t over it, but annoying nonetheless. Well, this situation reminded me of a former situation that was almost nearly identical to this current one. About 12 years ago I worked at a put supplies store called Pet Supplies “Plus” in Albany in the University Plaza on Western Ave. Unlike most, I kind of actually liked working there, but that’s besides the point. There were two women that I worked with that used to take an ungodly amount of smoke breaks. Just like now, it was annoying then too. The two women I mentioned before constantly took smoke breaks during the day. It got a little ridiculous so I started took to just standing outside for 5-10 minutes at a clip and just relaxed. I would see them take their own smoking break and I would wait until I noticed they had come back in and then I would go outside and take mine. My manager, Rich, noticed me doing it (it had been a few weeks of doing it by that point) before he finally said something to me. He just stood there dumbfounded for a second before he just went back into the store. He was probably pissed off that I was doing that, but he had to also know that I had a right. It was another two weeks of me doing that before he told the other two women they couldn’t take so many breaks and cracked down. Not sure how that would go over at my current job, hell they might not even notice (they probably will not actually), but maybe I’ll give it the old college try anyway. This entry was posted in damn the man!, people are stupid, rant. Bookmark the permalink.